The Very Rev. Michael Brehl, a Redemptorist of the Edmonton-Toronto Province, was elected Superior General of the Congregation November 4 during the General Chapter in Rome. Father Brehl is the 19th Superior General and the first Canadian to be elected to this office. Father Brehl was born in Toronto, Ontario, in 1955. He was professed a Redemptorist on August 15, 1976, and ordained to the priesthood on March 15, 1980. Among his assignments, Father Michael has served as a pastor, a missionary, a formation director, and Provincial Vicar. He had been elected Provincial Superior of the Edmonton-Toronto Province three times. 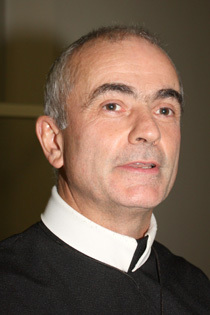 Father Brehl is widely respected as a retreat director and has given retreats to Redemptorists in various parts of the Congregation. He is well-known among the Redemptorists of the Baltimore Province for the outstanding retreat he gave us two years ago on St. Alphonsus and prayer. Father Brehl has also served as a moderator of the General Chapters in 2003 and now in 2009. His term of office as Superior General of the Congregation is for six years, and he will reside in the Redemptorist General House in Rome. There have been 18 Superiors General since the Congregation was founded by St. Alphonsus Liguori in 1732. We Redemptorists of the Baltimore Province congratulate our confrere Father Michael on his election as Superior General. We promise him our prayers to our founder, St. Alphonsus, to all our saints and blesseds, and to our great patroness, Our Lady of Perpetual Help, that they intercede to God as we seek to follow Jesus Christ, Our Most Holy Redeemer, in preaching the Gospel to the most abandoned, especially the poor.